They've done it again! 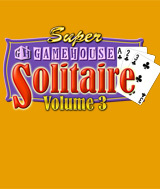 The maniacal minds at GameHouse have sifted through hundreds of card games and found 10 more fantastic Solitaire games! Whether you like the challenge of Scorpion or just a relaxing game of Concentration, you'll love these new single-player card games. Perfect for forgetting the troubles of the day, or sneaking in a quick game on the side.